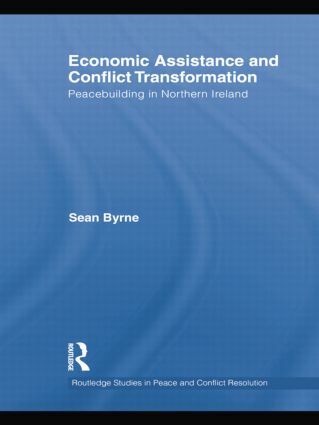 This book examines the role of economic aid in the management and resolution of protracted ethnic conflicts, focusing on the case study of Northern Ireland. The book describes the results of a study of the role of economic aid within Northern Ireland, through the viewpoints of citizens collected in an opinion poll as well as community group leaders whose projects received funding, funding-agency civil servants and development officers. The study explains the importance of economic and social development in promoting cross-community contact as well as within single-identity communities, and the need for a multitrack intervention approach to transform the conflict in Northern Ireland. It makes an important contribution to our understanding of how economic assistance impacts on a divided society with a history of protracted violence and provides important perspectives on the "peace through development" idea. One of the key unanswered questions relating to economic aid and preventing future violence is that of the significance of external economic aid in building peace after violence. By examining the respondents’ political imagery, this book expands on existing work on economic aid and peace building in other societies coming out of violence. Northern Ireland’s changing social-economic and political context reflects the fact that economic aid and sustainable economic development is a cornerstone of the peacebuilding process. The goal of the book is to provide a foundational knowledge base for students and practitioners about the role of economic aid in building the peace dividend in post-accord societies. The book will be of great interest to students of conflict resolution, peacebuilding, Irish politics, peace and conflict studies, and politics and IR in general. Sean Byrne is Professor and Founding Director of the Arthur Mauro Centre for Peace and Justice, St. Paul's College, University of Manitoba, and of Canada’s first Ph.D. program and M.A. program in Peace and Conflict Studies. He co-edited The Handbook of Conflict Analysis and Resolution (Routledge, 2009).